Contractors generally have what they need for the basic parts of a project. However, there are times when additional equipment is needed. Rather than purchasing special equipment, it is much more efficient and cost-effective to rent this equipment. With Network Crane & Rigging, you get the convenience of renting what you need, exactly when you need it. We have cranes on hand to help you complete the projects on your schedule in Concord, California, the San Francisco Bay area, Walnut Creek, Pittsburgh, Antioch, & Martinez, California. We work hard to deliver all crane equipment as quickly as possible or on a scheduled date as it’s not unusual for construction work to take place at all hours of the day. Some projects have tight time frames for completion and some even require work throughout the night. 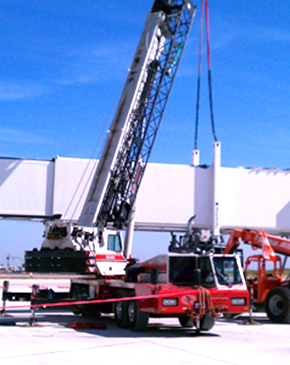 For all projects that happen around the clock, we are available 24/7 to meet your needs for crane rental. Regardless of your request, we start getting the equipment ready immediately. We want to emphasize that we ensure that all crane rental equipment is certified and has been inspected. Safety has always been a top priority for us, so all of our crane operators are NCCCO Certified. For this reason, all cranes are rented with the crane operator. Our operators are fully trained and certified to provide you with the best service possible, backed by over 40 years of experience.